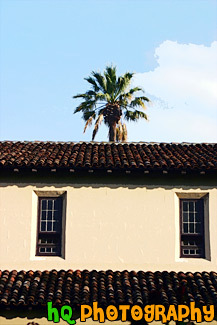 An interesting picture taken of the side of the Mission Santa Clara de Asis with a palm tree in the background. Mission Santa Clara de Asis is located at Santa Clara University and is a very beautiful site to see. At the center of the campus is the Mission Santa Clara de Asis, surrounded by the roses and palm trees of the historic Mission Gardens.